Commissioner Brandon Arrington's recollections of Osceola County fuel his belief in "Growing Osceola County's Future" with a strong economy and the infrastructure to support it. Commissioner Chairwoman Cheryl Grieb talks about growing up in Osceola County and her vision -- planting seeds in our community and "Growing Osceola County's Future," during the 2019 State of Osceola County address. Commissioner Fred Hawkins, Jr. talks about technology and the role it plays in "Growing Osceola County's Future." Commission Vice Chair Viviana Janer's experiences as a child growing up in NYC play a huge role in her vision for "Growing Osceola County's Future." Commissioner Peggy Choudhry's vision for "Growing Osceola County's Future" working with organizations to give people a hand up, not a hand out. District 3 Commissioner Brandon Arrington recaps the Community & Transportation Update held on December 4 at the Valencia College Poinciana Campus. Learn more about how Osceola County and its partners are working together to improve the transportation network in ways that will help residents in District 3 and the County. Representatives present from LYNX, Central Florida Expressway Authority, SunRail, the Florida Department of Transportation, Sheriff's Office, Tax Collector, Supervisor of Elections and Property Appraiser. In this video, you can join District 2's Commissioner Viviana Janer at the 5th annual Parranda with Santa at the Robert Guevara Community Center at Buenaventura Lakes. Everyone had a great time at the party, so remember to mark your calendars and come out next year and enjoy the Parranda with Santa. Many years ago, someone at Osceola County Public Works handed Gary Yeager a shovel. Now, he is in charge of a talented group of people in the traffic engineering office, and the Employee of the Month for December 2018. Watch the video to find out who Gary gives credit to for his success. Meet Road and Bridge's John Jeannin. Watch this video to find out how he made his way up through the ranks from a holding a STOP and SLOW paddle in 1993 to becoming Road and Bridge's newest director. Osceola County Board of County Commissioners meeting - December 10, 2018 - 5:30 p.m.
Osceola County Board of County Commissioners meeting - December 3, 2018 - 1:30 p.m.
District 2 Commissioner Viviana Janer, and District 4 Commissioner Cheryl Grieb were both sworn in for a second term at a recent ceremony at the Historic Courthouse. Watch this video to see highlights from the ceremony and thoughts from the re-elected County Commissioners. Osceola County is proud to employ many veterans. As a small token of gratitude, the Osceola County Employee Appreciation Committee held a luncheon in their honor. Thank you to all veterans who have served and sacrificed and continue to do so for our country. Osceola County Board of County Commissioners - Meeting on November 5, 2018 at 1:30 p.m. Sometimes it's rough when there's no where to take your dog to run and play. Well, now there is a place in Buenaventura Lakes off of Lake Villa Way with a beautiful lakefront scenery and a place for dogs and people to make new friends. Watch this video to find out more. 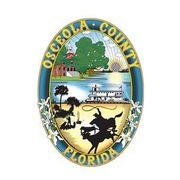 Osceola County, the City of St. Cloud, Florida and City of Kissimmee Government invite all Osceola County residents to celebrate the 4th Annual Great Outdoors Day event, to be held at St. Cloud's Lakefront Park on November 3 from 10 a.m until 3 p.m.
Watch this video for exciting news from Osceola County Board of County Commissioners Chairman Fred Hawkins, Jr.
Osceola County Community Development Senior Planner Melissa Dunklin discusses future development plans during a recent community open house. Watch this video to see how these changes affect the development of the county today and into the future. Lisa Smith had an idea to save the County money...a WHOLE lot of money. She realized that it would be much less expensive for the County to purchase a laser grader to level ball fields instead of hiring a company to do it. She and her crew take great pride in maintaining the ball fields. Watch this video to find out more about Lisa and her awesome team! Osceola County Board of County Commissioners - Meeting on October 15, 2018 at 5:30 p.m.
Osceola County Board of County Commissioners - Meeting on October 8, 2018 at 1:30 p.m.
Osceola County Board of County Commissioners - Meeting on October 1, 2018 at 1:30 p.m.
Take a tour with Chief Sorenson around the brand new Station 73. There are many wonderful pets available for adoption at Osceola County Animal Services. Commissioner Cheryl Grieb is at the Shelter and she would like to introduce you to one very special pup named Delilah. She is a 4-month old mixed breed puppy with special needs. The shelter is looking for donations to help purchase a cart so that she can have increased mobility. Watch this video to see how you can help Miss Delilah and all the other pets at the animal shelter. Her job is complex and ever-changing, but that's what makes it a challenge for September's Employee of the Month, Iris Soto. Iris and her team work dilligently behind the scenes to make sure the County's mission is a success. Watch this video to find out just a small portion of Iris' duties, and see for yourself why she was selected as September 2018's Employee of the Month. Osceola County Board of County Commissioners - Meeting on September 17, 2018 at 5:30 p.m.
Osceola County Board of County Commissioners - Meeting on September 10, 2018 at 1:30 p.m.
All aboard! The Sunrail's Southern Expansion is now complete. Osceola County residents can now enjoy traveling stress-free from Poinciana to Debary and all points in between.. So check out this fun video produced by the Public Information Office's talented new Valencia College intern, Luke, and then, try the train! Their names are Will and Darrell and they are a dynamic duo. They can be seen all around Osceola County, but only if you look behind the scenes. Along with many other tasks, they are responsible for setting up the tents, tables, chairs and sound system for County events. Watch this video to find out how they feel about their jobs and what it takes to be marvelous Employees of the Month. Easy Foods, a producer of corn and other snack products, unveiled its new, 97,000-square-foot production facility in Osceola County. Commissioner Cheryl Grieb explains why it is important to keep chemicals and waste out of our drainage system. Commissioner Viviana Janer explains why it is important to keep debris out of our storm drains. Osceola County Board of County Commissioners - Meeting on August 20, 2018 at 5:30 p.m. (Closed Captioning available). The people who work for Osceola County Government come from many countries and have a variety of cultural backgrounds. At a recent Board meeting, a parade of flags representing the County's diversity was part of the proclamation in honor of Multicultural Day in Osceola County which will be August 17, 2018. Osceola County Board of County Commissioners - Meeting on August 6, 2018 at 1:30 p.m.